Home »Library »What are Pink Stamps? 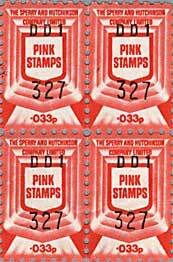 Pink Stamps were trading coupons that rewarded consumers for grocery store and gas station loyalty with free appliances, furniture, and other items. The British equivalent of American Green Stamps, both Pink Stamps and Green Stamps were both owned by Sperry & Hutchinson Co.
S&H Green Stamps were the dominant loyalty program of the 20th century. On the right are a few samples of Pink Stamps. As you can see, they seem to be more red than pink in color. For more information on Sperry and Hutchinson, there is a small article on Wikipedia.